In late 1977 I acquired my first ‘real’ watch – a Rolex GMT Master which of course in those days was equipped with a matt black dial with no white gold embellishments, an acrylic crystal which I scratched on the first day and which was water resistant to all of 50 meters. At the time, as far as I was concerned then the specification of the Rolex was the norm for a sports watch which was by no means cheap. Whilst Rolex was indeed a ‘popular’ watch during the 1970s, it was perhaps not as well known, popular or more accessible as it became during the 1980s with the advent of such ‘innovations’ as instant finance. With increased ownership came improvements and changes to the specification; thus we saw the introduction of glossy dials with applied white gold indices, sapphire crystals, and hi-beat movements. Whether or not the aforementioned ‘improvements’ were indeed such is arguable from a watch enthusiast’s point of view. The tool watch nature/intention of the 1970s Rolex (and others) would be proven of course by the adoption of the Submariner model by various official and commercial organisations around the world for issuance to their operatives. These were without doubt rugged, accurate and dependable timepieces which could be worn with confidence for their intended purpose. One adopter of the Rolex Submariner was of course the British Royal Navy who issued the watch to its divers during the 1970s. A friend of the family was one such diver whom I recall as having worn a standard issue Submariner when I met him for the first time soon after acquiring my GMT Master. I remember well looking at the oversized hands (particularly the hour hand) of the Rolex in awe and being impressed by the simplicity and purposefulness of the overall design. As an aside, this was the first time that I took any note of the standard issue woven nylon strap – later rightly or wrongly to become known as the ‘NATO’ strap. 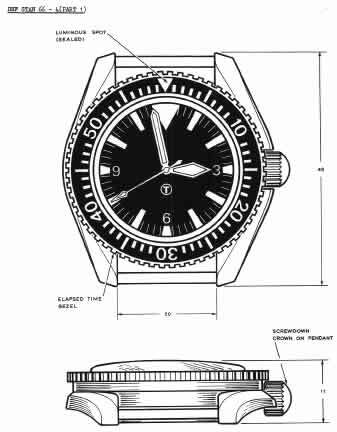 That simplicity and functionality of design was ideal for the likes of the Royal Navy and whilst the Rolex did not follow the standard specification to the letter from a visual perspective (hand design excepted) it was nonetheless considered fit for purpose having passed those tests formulated by the Ministry of Defence in the UK for ‘Watch, Wrist, Divers”. 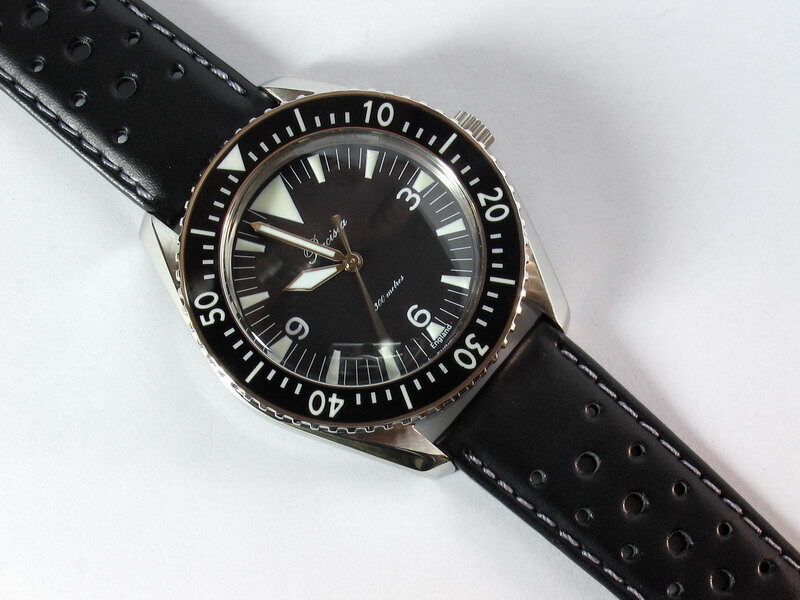 Of course the Submariner was not the only diver watch employed by the likes of the Royal Navy during the 1970s. Blancpain and Omega both supplied wristwatches to the armed forces of the UK at various points and in the case of Omega the Seamaster 300 was the watch chosen for issue to divers. 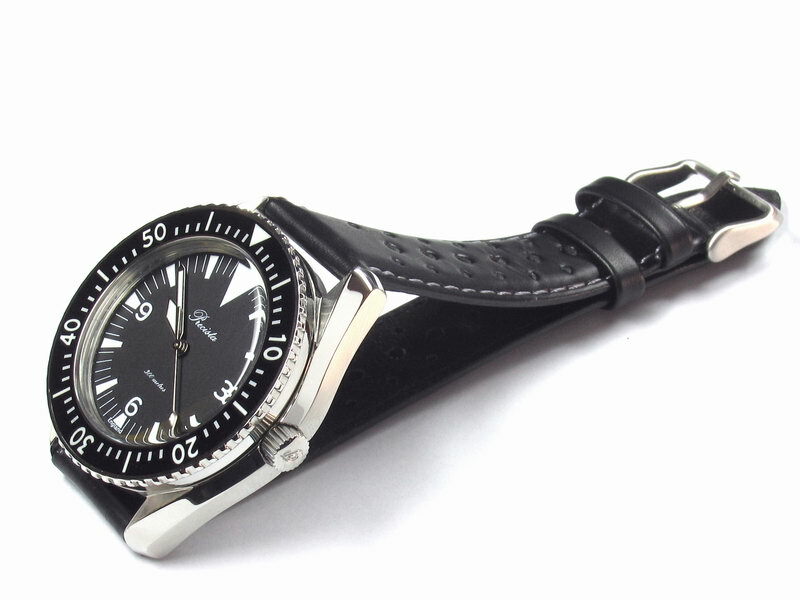 Very much a tool watch in the real sense, the Omega is one watch illustrated as an example of the Ministry of Defence requirement for an issue diver’s watch. My earliest recollections of an issued dive watch in real world use would date back to the early 1970s when I spent many hot months in Malta with my father. A previous career had meant that he often liaised with members of the armed forces and often on our visits to the Mediterranean he would meet up with former colleagues. I remember well the balmy evenings being sat on the main Sliema waterfront with my father whilst he chatted away with personnel either stationed in or passing through what was still an important British base. Many were Royal Navy crew of various function and rank; in those days my father wore an Omega Constellation in 18k gold and was suitably proud of it; many would comment on its good looks and I distinctly recall one occasion where briefly the conversation turned to wristwatches and Omega. The gentleman my father was talking to was also wearing an Omega only this one was issued to him for work purposes; whilst the comments on and showing off of each other’s watches maybe lasted less than one minute, I remember my eyes widening at the size of this amazing looking wristwatch which had an outer ring that turned! It was indeed an issue Omega Seamaster 300 and my father was talking to a Royal Navy diver. Whilst this was a one off occasion, it nonetheless represents a time where the collectables and unobtainables of today were being utilised for what they were intended. I have alluded in other watch reviews to the spirit and atmosphere of times long gone when many things were perhaps much simpler than they are now – to the days of piston and turboprop intercontinental air travel, to the days of RAF Lightnings and Canberras roaring overhead, to the days where machines were powered by springs and cogs because there was no choice! Many people perhaps care little to think of such times or place any store on them; the ‘end user’ market for many types of everyday items from the post World War II period might suggest otherwise. Of course the subject matter at hand is wristwatches and indeed, this is an area of collecting that has seen enormous advances in both coverage and prices in recent years depending on the type in question. There are many reasons for the purchase of vintage watches – ranging perhaps from the pure profit/investment motive to simply replacing something from one’s younger days. From a personal perspective the simplicity and perhaps ‘innocence’ of pre-sapphire, pre-titanium, pre-argon filled capsule, pre-co-axial, pre-film star marketed wristwatches is what attracts me to them. However, I am a user rather than an outright collector and perhaps like many watch enthusiasts eagerly anticipate the introduction of the latest wearable ‘re-edition’. More often than not however I am disappointed for one reason or another. Often the manufacturer has made fundamental changes to the original design (viz. the first Doxa 300T re-edition with integrated bracelet) or includes a changed feature which just doesn’t work (viz. the hour hand on the Certina DS-3) or charges a huge premium for the fact that they have reproduced something from the past (viz. Omega museum collection Pilot 1938). If a watch truly captures for me the spirit of the times during it (or the watch to which it pays homage) was originally freely available then my interest is piqued. If it is capable of performing as well as, or better that the original then so much the better. Finally, and most importantly, if it captures the spirit of the original watch but at a reasonable price then I am ready to buy it. The latest timepiece to have had the above effect on me is the Precista PRS-14 from Timefactors. This one represents Timefactors’ interpretation of one watch which was issued to the likes of the person I met in Malta some three decades ago. The Precista PRS-14 is the latest offering in the range and is unashamedly a homage to (not a copy of) the late 1960s Omega Seamaster 300. Omega itself is sometimes derided in watch circles for the frequent changes it makes to a specific model and the Seamaster diver watches are no exception to this. 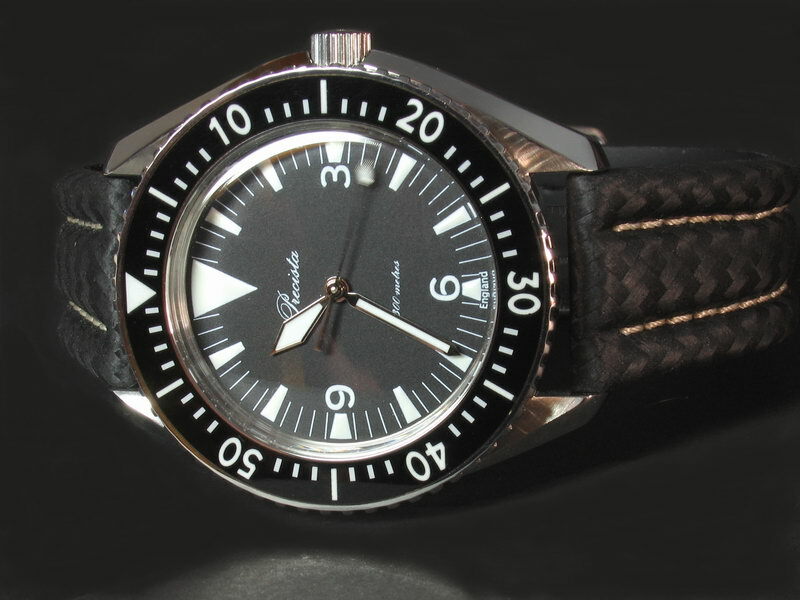 Thus, since the Seamaster 300 of the late 1960s there have been complete design changes evolving through the early quartz version through to the present day ‘James Bond’ Seamaster. Note that the very latest ‘Planet Ocean’ makes a significant nod to the past in its design but does not go all the way in providing a current day re-edition of what many consider to be the definitive Seamaster diver. 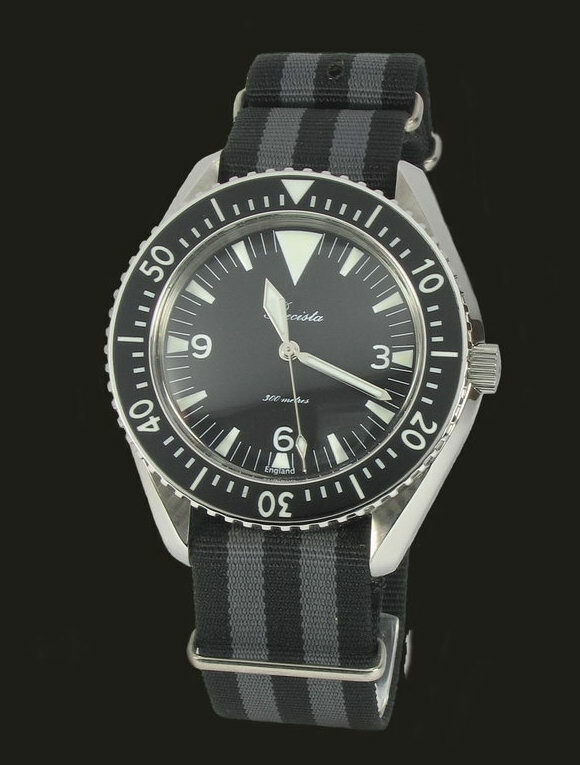 Of course, original Seamaster 300s are available in both the civilian and military versions but prices are rising, fakes abound and everyday use including underwater might not be recommended for various reasons (those responsible for maintaining the wristwatches of the Royal Navy often had to deal with leakage problems on what were then new Omega watches). 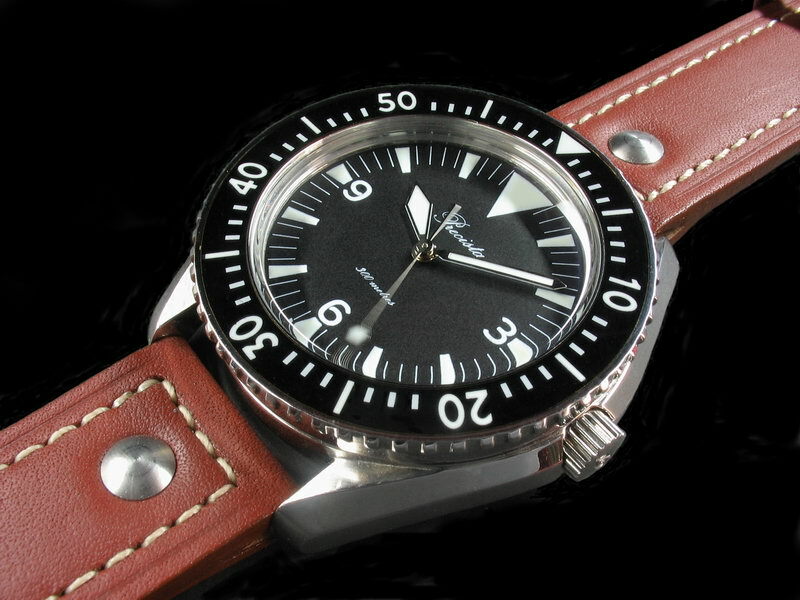 Until late May 2005 there was no real and affordable alternative for those who wanted the looks, construction and functionality of the ‘classic’ issued dive watches of the 1970s. The Rolex Submariner 5513 with matt dial and plexi crystal is long discontinued and a restored, usable example would cost between US$2-3000. As can be seen, the watch illustrated at left has a simple, very legible dial and a substantial case; the styling has often been admired for the curvature and cut of the lugs; this styling has continued to the present day in the Speedmaster line and was reintroduced to a certain degree with the ‘Bond’ Seamaster and is most definitely there with the Planet Ocean. There were also requirements in the case of diver’s watches to be capable of being demagnetised after exposure to a strong magnetic field and subsequently being magnetic themselves only to a specified degree at most. It goes almost without saying that here in 2005, there are many watches which could be purchased for relatively little outlay that would meet the above requirements easily. Suffice to say, such watches might not be those that watch enthusiasts would go out of their way to buy. Certainly, in the case of homage watches then meeting or exceeding original specification may not be particularly difficult to achieve but in certain cases will elevate the watch in question from the status of a timepiece that looks extremely like the original to one which is more than a ‘toy’; indeed, to one which most certainly is a serious timepiece which can be used with confidence for the originally intended purpose. In the case of the Precista then, the intended purpose of the original was for diving and in this respect the visual as well as technical specification would bear this out. In a similar vein the Rolex 5513 Submariner would fit this profile. In my eyes, the Omega Seamaster 300 of Royal Navy issue and the Rolex 5513 are excellent representations of what a tool watch (in this case diver’s) should be. Yes, both are old fashioned and in many ways belong to another era….and this may be one of the reasons why they are so sought after today. Again, both have been discontinued in their original forms for a long time and simply cannot be purchased brand new. From a purely personal perspective (though I suspect that there are many others out there who feel the same), I enjoy the old fashioned. This most certainly extends to wristwatches; many (most) of my wristwatch purchases are of examples that for me represent times past both of a general and personal nature. In this respect, there is a feeling which is difficult to put into words of wearing a watch with the looks and feel of those worn by people whom I met or associated with a long, long time ago. Even better if I can wear such without worry and the watch carries a name that in some way is related along the way. The Precista brand has been used once again to bring to market a wristwatch that takes us back in time in terms of looks, ‘feel’ and in one notable area, specification. 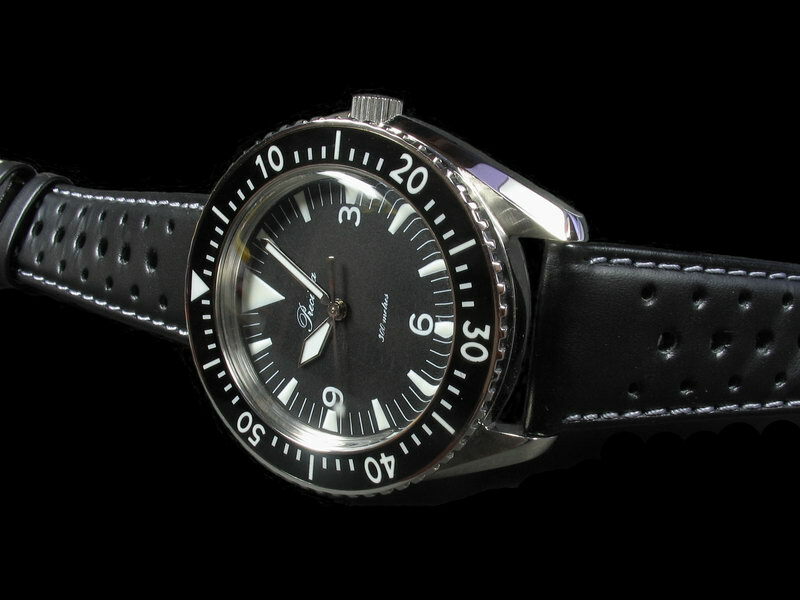 The PRS-14 is a time-only, 300 meter rated automatic dive watch with acrylic crystal. It, as mentioned earlier pays homage to the classic Omega Seamaster 300 design and in terms of the ‘time travel’ factor then it hits the spot for me. I took delivery of my example on 8 June 2005. Timefactors continues to ensure that purchasers of its wristwatches are not left wanting in terms of what comes as standard. Although I asked for my watch to be shipped minus the standard box it normally comes presented in a ‘treasure chest’ type box which I assume has originated from the factory where the watches are manufactured. It does its job no doubt but for fear of review repetition I would mention that I have little interest in the box. I am more interested in the contents! 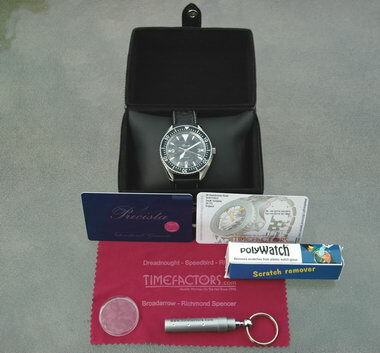 Thus, the standard package for the Precista includes the box, the watch (fitted with a choice of strap), a spare crystal, a Timefactors branded LED mini torch, a credit card type warranty along with a Timefactors care leaflet but specific to the PRS-14. 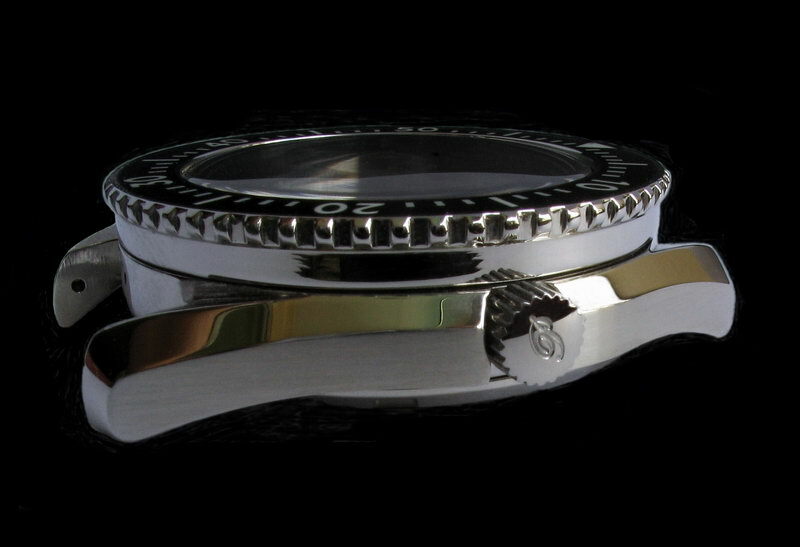 In addition there is a tube of Polywatch which is a specialist watch crystal polishing compound. All in all a very complete package and very thoughtful of Timefactors to include the extra crystal. This will no doubt satisfy those buyers who are wondering where they may obtain a new crystal in twenty years time! At this point it seems appropriate to mention my impressions when seeing the watch for the first time. Given that Timefactors is very open about watches which are either on the drawing board or in development then dial illustrations and prototype pictures of the PRS-14 have been available to view on the internet for some while. As well as this of course, the watch is illustrated on the Timefactors website. This is one of those watches that just has to be seen ‘in the metal’ and handled in order to appreciate it. Some timepieces look better in a photograph and others just cannot be captured accurately ‘on film’. The PRS-14 falls into the latter category and on seeing the watch for the first time I have to admit to a double-take. Despite it being a tool/sports watch, there is an air of refinement (for want of a better phrase) that no picture will capture. It was indeed like opening the proverbial time capsule – the watch is certainly something from another era yet brand new and fresh. The only personal experience I can equate this to would be to that of first seeing my old Rolex GMT Master way back in 1977. Initial impressions then were good, the watch ‘felt right’ on first seeing and handling it and the old fashioned air which I had paid for was present and correct. In many respects, the case design of the PRS-14 is largely the watch’s very ‘raison d’etre’. It is a design dating back to the mid-latter 1960s with a complicated and (in my opinion) very beautiful lug design forming part of an overall rugged and purposeful profile. There is no doubt at all where the design for the Precista originated and this design was the signature of the Omega sports models of the day – the Seamaster and the Speedmaster shared the same case profile to the extent that bracelets were fully interchangeable. The likes of Universal also adopted this design theme and personally I have long admired it. It is best illustrated pictorially rather than described suffice to say that the combination of brushed and polished surfaces combine with case curves and cut to form what can only be described as a classic shape. The case was tooled up for and manufactured by Walter Fricker of Germany who was also responsible for the Dreadnought and has manufactured for the likes of Sinn amongst others. Case construction is in three parts – the case body, the case back and the rotating bezel. I have already discussed the shape and profile of the case and its lugs; with regard to finishing, the case body has been finished to a very high standard. Particular mention must be made of the brushed case sides – the brushing has been beautifully executed to what I would describe as an ‘Omegaesque’ finish; it is straight and neither too fine nor too coarse. Polished surfaces are also well executed a with a good and even lustre. With regard to the overall cut of the case, again this shows that Fricker is no newcomer to case manufacture – where edges should be sharp they so and where they should be rounded the same applies. I would imagine that this is no easy case to manufacture and overall I feel that Fricker have done an excellent job in capturing the spirit of the ‘original’. The PRS-14 is a relatively thick watch for a non-chronograph and this is the result of employing a substantial case back (see below) and of designing in anti-magnetic properties to the order of 80,000 A/m; such properties are achieved by employing an anti-magnetic movement cover and movement retaining ring along with a soft iron dial. The watch is rated water resistant to a depth of 300 meters as indicated and this is achieved in part by the use of two as opposed to the more usual one O ring. Thus, there is a feeling of ‘double-security’ with this arrangement and this attention to detail would bear out the statement that this is a real watch as opposed to a toy. In a similar vein, the PRS-14 features a screw down crown, the design of which is lifted from the earlier Dreadnought and which has been tested to a pressure equivalent of 2000 meters. In this case, the crown is of relatively compact dimensions with a diameter of very slightly over 5mm and a width of 3.5mm. Some may argue that this is on the small side however it could be argued that in real world use (i.e. if this watch were worn as a main watch and not sat in a case) then the crown would need little use as there is no date to correct, the watch is automatic thus would not need winding manually and perhaps most importantly – less protrusion from the case means less likelihood of damage. As it stands, the crown is easy enough to operate, screws down snugly on the well threaded tube and is well finished to boot. It is also signed with the Precista ‘P’ which is a nice finishing touch. The black bezel follows the design of the Ministry of Defence standard in that it employs an acrylic insert with luminous markers. Thus, there is a luminous triangle at twelve with the five minute markers/numbers also being luminous; all markers and the bezel colour itself are sealed under what is hot poured and then polished acrylic. I do not think it possible to replace the bezel insert as it appears to be manufactured as one unit with the bezel. However, scratch damage is easily repaired on a do-it-yourself basis using the supplied Polywatch or if need be plain toothpaste. The bezel itself is uni-directional in one minute clicks and ratchets firmly and precisely, there is a positive click at each minute which has none of the tinniness found on some diver watches with 60 click bezels. Construction is of all polished steel with easily gripped serrations which themselves number 60 around the perimeter. Whilst retaining its old fashioned look and construction, the bezel has obviously been updated in terms of its uni-directional nature which no doubt would be a welcome revision for those who use the watch for diving. A note should be made here about the fact that the Precista does not feature fixed lug bars as would a military issue watch; the reason for this may be that Timefactors themselves realise that many customers will want to change straps on a regular basis; this being said, of course the watch to which this one pays homage was itself available in a civilian version and was indeed a standard model in the range. The engraving is clear, precise and dispenses with unnecessary words and phrases. The serial numbers employed by Timefactors are date based along the lines of Seiko/Citizen. Thus 04 refers to 2004, N refers to November and 0009 refers to the actual case number in the series. Incidentally, the PRS-14 is not a limited edition and should be readily available for some time to come. The case back is fully polished to a high standard and accounts for 3mm of the watch’s overall thickness. 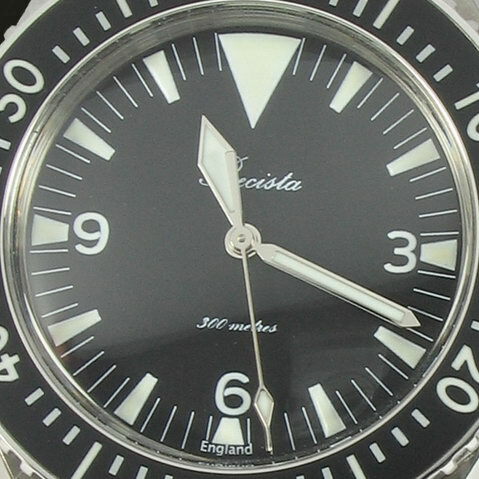 Overall, the case of the Precista closely resembles that of the watch illustrated in the published Defence Standard and captures well the design theme. It is substantially constructed , very well finished and thought has gone into protecting the internals from both water and magnetic influences. A note on size: we are currently in the midst of a ‘the larger the better’ period in the wristwatch world and the PRS-14 bucks the trend in remaining a standard sized dive watch. I assume that it would have been easy enough to bloat the case to 43 or 44mm which in my opinion would have taken a lot away from the beauty of this watch. 40mm across the bezel and the watch is suitable even for those without large wrists – myself included. It is comfortable, discreet and unobtrusive as a sports watch can be; it sits well on the wrist without making a ‘I am wearing a clock!’ statement. 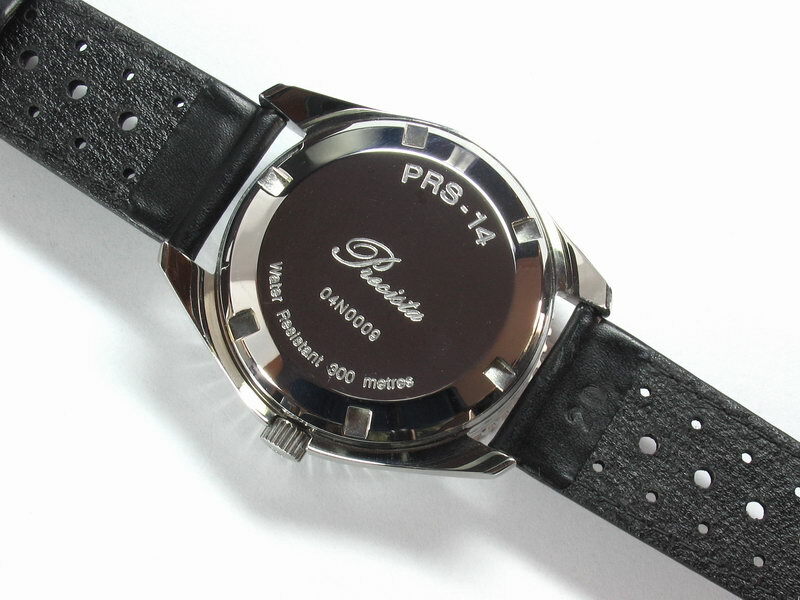 As already mentioned, the dial of the PRS-14 is manufactured from soft iron. 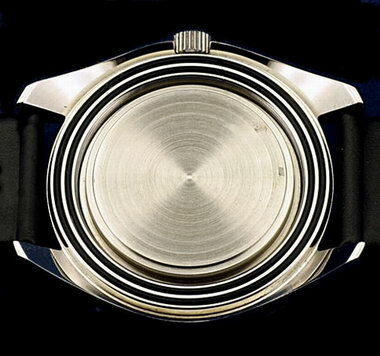 This has traditionally been used where a requirement has been needed for anti-magnetic properties and thus can be found on watches ranging from those specified for military applications through to those made for civilian consumption for example by the likes of Rolex (Milgauss) and IWC (Ingenieur). The dial design itself is of legible simplicity and such design is still employed today in the watches issued to the divers of the Royal Navy. Thus, there is a large triangle at the twelve position which should ensure the correct orientation of the watch for reading the time in extremely low light conditions; at the hour divisions we have the elongated trapezoidal shaped markers interspersed with thin one minute markers. Arabic numerals are employed at 3,6 and 9 as per the original UK Ministry of Defence illustration. In more detail: the dial measures 28.5mm in terms of the visible area and is finished in a matt black; to be more specific, this ‘black’ appears more of a dark charcoal grey as is often the case with matt finished dials. In bright sunlight one is not going to get the blinding reflections that are emitted from a glossy dial. The dial finish is well executed , even and pleasing to the eye. The dial is signed ‘Precista’ below the 12, ‘300 meters’ above the 6 and finally, ‘England’ below the 6. Refreshingly, all dial script has been kept to a small size as well as to a limited number of words. Thus, legibility is not affected at all by what has been chosen to decorate the dial or rather, one’s eyes are not distracted by a short story on the dial. 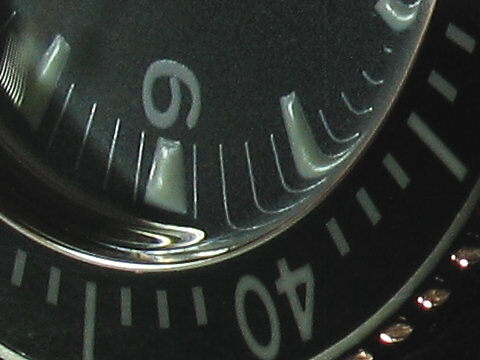 The centre of the dial looks well balanced with the arrangement chosen, the script on the dial is in a gloss white and passes scrutiny under a 10x loupe given that the dial surface itself is uneven at the macro level due to its finish. Why is this watch marked ‘England’ ? There was some online debate concerning this during the watch’s development; it would seem that this is simply dues to the fact that Timefactors is based in England and this project was conceived there. No claims are made to the watch being ‘Made in England’ or some such. From a purely personal perspective (I am English after all) it is pleasing for me to see that word on the dial. The minute hashes are also consistently printed and extend some 75 percent of the length of the hour markers. The triangle at 12 along with the aforementioned hour markers are base printed in white with luminous application to the top. Super Luminova is employed for the luminous and this is of the white variety – application is of the visually appealing pillowed variety thus there is a good thickness giving a slight 3D effect as opposed to the flat printed application found on other wristwatches. 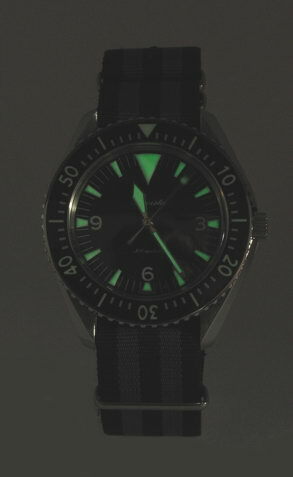 Whilst the compound is white in daylight at night the emitted glow is green – the dial markers glow well after a charge in daylight or artificial light and whilst the characteristic progressive dimming takes place, it is possible to read the time in the early hours of the morning. There seems to be something of an obsession with the luminous properties of wristwatches amongst watch collectors which is interesting to say the least. I would imagine that a diver would require ‘good’ luminosity for 2-3 hours and in this respect the likes of the Luminova family should not disappoint. The hands of the PRS-14 follow the form of those employed by various watches (e.g. Certina DS series) of the era to which this watch points. The proportions of the hands are perfectly in keeping with those of the dial indices and the dimensions are appropriate – thus the seconds hand extends the full length of the seconds/minute markers and the minutes hand extends half way into the same; visually pleasing and an aid to accurate time reading when necessary. All three hands are executed in polished steel and feature white Superluminova fill to match the dial. The hours and minutes hands are of course of distinctly different shapes commensurate with the avoidance of errors in reading elapsed minutes. Once again, this hand design is used to this day in watches used by the British forces. In both daylight and at night, the colour of the luminous fill matches the dial indices perfectly which will please those for whom such is important (myself included). The crystal of the PRS-14 really does justice to the origins of this watch and is the notable exception to any improvements on original specification that Timefactors have incorporated. Anachronistic in today’s world of sapphire with anti-reflective coatings this is a domed acrylic crystal with a thickness of 2mm at its peak. I assume that the use of this type of crystal was decided on primarily for being true to the spirit of the original and possibly to save on costs (a domed sapphire of this type would have added somewhat to costs). For me, the originality factor comes first and as I have stated in other reviews, acrylic certainly has its advantages – reflections are kept to a minimum, the crystal is difficult to shatter and of course, when it gets scratched it is quite satisfying to sit for ten minutes with a cloth and some Polywatch to bring it back to its former glory. Timefactors include a spare crystal as mentioned earlier for use should the dreaded happen. This aside, an acrylic crystal is cheaply and easily replaced and even if this is not necessary, it will age in relation to the watch (once again, I allude to previous writings and mention of the battered watch with a strangely mint sapphire crystal!). The dome of the crystal extends below the bezel line thus there is no edge to chip; from everyday use damage therefore should be limited to scratches. Overall, the dial/hands/crystal combination of the PRS-14 does as intended – legible, luminous and ‘instant’ as well as functional. For me, the lack of gloss and polish is welcome; thus no glossy dial and no applied indices, little script and of course in this case – no date window. 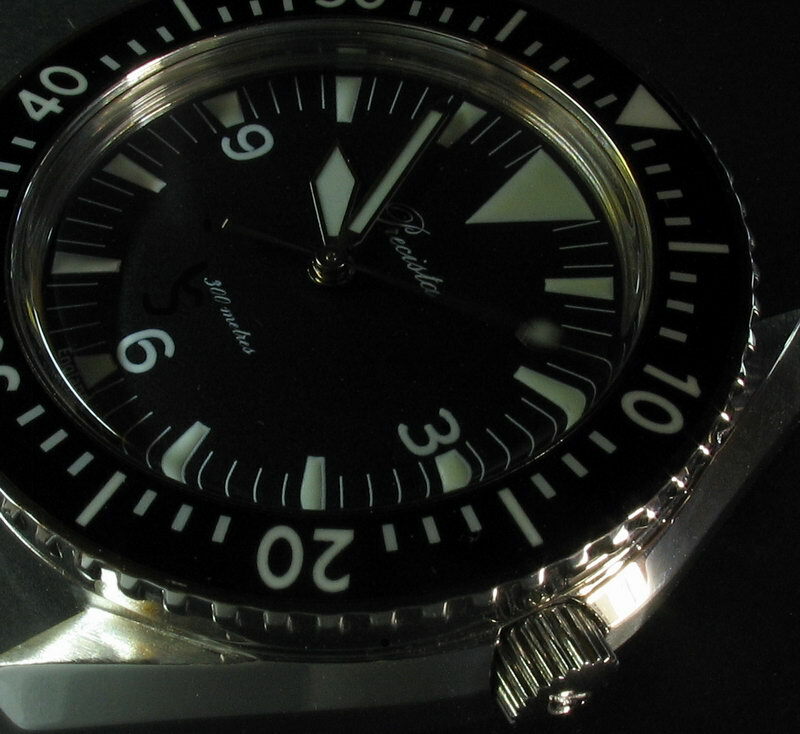 In terms of legibility, this is a diver’s watch in one of its purest and classic forms. (1) The watch is to embody a 24/30 mm diameter self-winding movement fitted with a fully jewelled double roller club tooth lever escapement embodying a shock absorbing device. The movement is to be fitted with not less than 17 jewels. The calibre number is to be stamped or engraved on the movement in such a position that it will be evident on removal of the case back. (2) The balance and balance spring are to be constructed of such non-magnetic materials that the requirements specified in clause 7e are met. 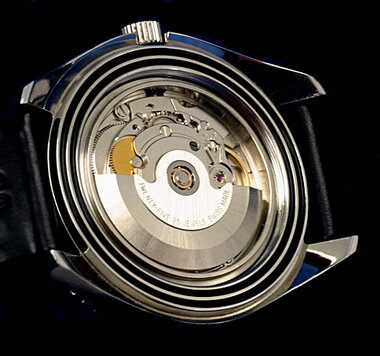 (3) The mainspring when fully wound is to drive the completed movement a minimum of 30 hours without rewinding. The mainspring is to be made of unbreakable, non-magnetic corrosion resisting alloy and fitted with a slipping brace robust enough to allow minimum slip of the mainspring in the barrel when fully wound. (4) The movement is to be provided with a lever index regulator. The completed watch is to meet the timekeeping accuracy requirements specified with the regulator set at mid-point of adjustment plus or minus 20% of its total range. The movement is to be self-wound and stem set, with the winding and setting mechanism incorporated as part of the movement and operating independently of the case. Entrance for the stem is to be located at the 3 o’clock position of the dial. The stem and crown assembly is to be of pressure-tight construction. O-rings are to be used to maintain a rotary pressure-tight seal between the stem, screw down crown, and case pendant. The self-wind mechanism is to consist of a pendulous weight pivoted at or around the centre of the movement and engaged to the barrel arbor in such a way as to impart a winding motion to the mainspring with any swing of the weight through 360º. Means are to be provided to enable manual winding of the watch by turning the winding and setting crown. Winding and setting operations are not to impair the timekeeping or pressure-tight properties of the watch. Means are to be provided to prevent over winding by provision of a slipping attachment in the mainspring barrel. As with many ETA calibres, it is possible to specify certain options and in the case of the PRS-14 it appears that the balance wheel has been upgraded from that of the standard version. In brief, the ETA meets specification and more. This is a modern though well developed and proven movement and as may be well known to many readers of this review, widely used in various forms in a range of watches extending (in refined guise) to watches costing many thousands of pounds. I would suggest that the main criterion of a movement for use in a watch such as the PRS-14 would be that of ruggedness. The 2824 is proven to be reliable and rugged though as with any automatic movement, then severe shock will undoubtedly have a detrimental effect. Of course, to take punishment beyond the norm, then a quartz movement would be preferable but that, by its very nature would go against all that the PRS-14 is meant to be. In terms of accuracy, the 2824 is capable of chronometer rates and my example is currently keeping a stable daily rate of +8 seconds per day under everyday wearing conditions which whilst not within chronometer specifications is well within the stated ‘ …daily rate of the ‘vertical crown’ positions is not to exceed plus 30 seconds or be less than 0 seconds’ as per the Ministry of Defence requirements of the Omega era. During the 1970s there were ETA movements available which could be considered the predecessors of the 2824; of course the Omega Seamaster and later the Rolex Submariner used by the Royal Navy had in house movements but for a brief period in the very early 1980s the last of the issue automatics (by CWC in this case) was equipped with an ETA movement. If, for whatever reason there was a current requirement for an issue automatic dive watch then I would wager that it would be equipped with an ETA movement if supplied by those other than Rolex. With regard to the standard straps then firstly to the ‘Rally’ and this one has the 1960s/1970s quite literally stamped all over it and I feel is the perfect choice if the Precista is to be worn on leather. The remborde construction is to a high standard in smooth leather with accurately and neatly punched holes; padding is single with the strap being some 3mm in total thickness. Stitching to the top of the strap is in a contrasting but discreet grey thread. 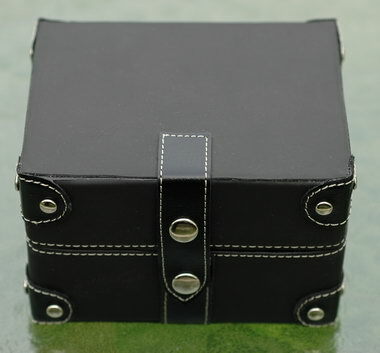 The backing of the Rally is in coarse grained black leather. Finally to the buckle,which is stainless steel with a brushed finish to the visible surfaces; buckle width is 18mm commensurate with the taper of 20>18mm of the strap. The Carbon strap is modern in design and materials; it is constructed topside of leather with a carbon fibre patterned synthetic coating. This strap is padded to approximately 4.5mm thickness at the lug ends reducing to a little over 2mm at the buckle/pointed ends. The backing is rubber and stamped ‘tropical’ which I assume means that the strap is resistant to moisture to a greater degree than standard leather. The greyish black of the Carbon matches the dial of the PRS-14 well in my opinion though I prefer the vintage look of the Rally. Both straps are constructed to a very high standard I have to say and would make good alternatives to each other if one is a regular ‘strap changer’. For me, the PRS-14 will likely stay firmly on a NATO which seems to befit its design and purposeful air. This review has considered a newly introduced watch based upon a design specification issued by the British Ministry of Defence some thirty years ago. Due attention and consideration has obviously been given to the specification and construction in order that the Precista PRS-14 will withstand the use for which it is intended and surpass those requirements of the original Defence Standard. Presentation is excellent along with overall fit and finish and appropriate given the manufacture from which the watch originates. For those who want the looks, feel and basic functionality of a true diver’s watch from another era then the PRS-14 will not disappoint. Given the specification and construction standards of this watch I believe that it will be durable, reliable and long lasting; a watch that one could purchase, own and wear for literally decades to come. In a time when perhaps more and more of us do indeed look back (myself included) to both the days and products of the past and wish we had that proverbial time machine then here is one opportunity to experience something that takes us very close. Tagged Precista, PRS-14, Seamaster 300. Bookmark the permalink.